On Monday, December 10, strange blips appeared on radars which has left aviation officials baffled. Nearby military bases have confirmed they are not responsible for the oddities which has left the National Weather Service (NWS) in a state of bewilderment. The large blips were huge, storm-like presences on the radar which stretched through Kentucky and Illinois. With no answer apparently in sight, many on social media were keen to point to the answer which often pops up in these situations – aliens. Social media users took to Twitter to claim the 50-mile radar appearance was due to a swarm of UFOs flying over the skies of middle-America. However, one meteorologist believes there is a much more simple explanation for the strange phenomenon. 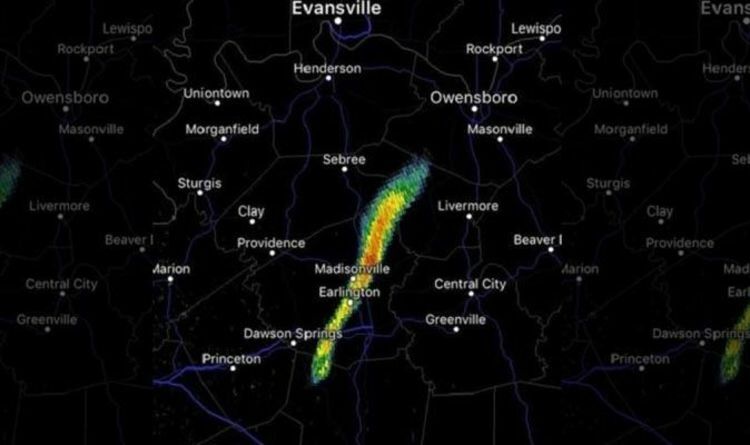 WEHT-TV meteorologist Wayne Hart tweeted says the fog was caused by chaff – a radar-jamming material sometimes used in military exercises which essentially blocks up the radar – as they claim it has done in this case. The NWS seemed to confirm this, and explained why it was moving so slowly and failed to disperse: “Upper level winds can be much stronger this time of year. “However, winds aloft late Monday averaged 10 to 15 mph from the north northwest.